The traditional robe of the Middle East and <?xml:namespace prefix = st1 ns = "urn:schemas-microsoft-com:office:smarttags" />North Africa usually made in a homespun, heavy fabric in plain color or wide stripes, and often heavily embroidered at the yoke, on the body, hem and sleeves. For dancing, a lighter weight material such as cotton or polyester blend lining fabric might be more comfortable. Embroidered trim may be done by hand or machine. The chemise may be closed down the front, or pulled back to leave the mid ruff bare. Separate cutting lines for small, medium and large given on same pattern. The traditional caftan is a long, coat like garment with long sleeves worn throughout the countries near the <?xml:namespace prefix = st1 ns = "urn:schemas-microsoft-com:office:smarttags" />Eastern Mediterranean. Usually made of a beautiful fabric in striped or brocaded silk, velvet or cotton. It may be held by a cummerbund or hizzaam wrapped around the waist. 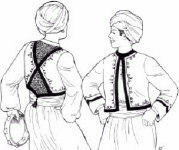 The sides may be left open to the hip and worn over harem pants, or sewn closed and worn alone. The bottom, neckline and sleeve edges may be trimmed with woven braid or embroidery. A fun variation: Trim with multi-color ribbon streamers sewn across the shoulders, the ends hanging loose at front and back. Separate cutting lines for small, medium and large given on same pattern. A modern rendition of a native Moroccan caftan-like robe with long, loose raglan sleeves. The traditional djellaba is the age-old hooded cloak of North Africa and the <?xml:namespace prefix = st1 ns = "urn:schemas-microsoft-com:office:smarttags" />Near East and our version makes a wonderful cover-up for your belly dance costume. Make it in a knit velour trimmed with braid, a brocade trimmed with velvet ribbon or a lightweight wool. You might even try brightly patterned velvet finish bath towels for a different look. Separate cutting lines for small, medium and large given on same pattern. A long circular mantle with hood worn by Arabian men and women when traveling. With it the women sometimes wear veils. We show two versions, full length and knee length. May be lined or unlined. May be made of heavy satin, velvet, corduroy, wool or lightweight brocade. One size for women and one size for men. Both are shown on the same pattern. A primitive Muslim garment of Africa, Turkey & Persia which serves as a cloak and blanket. Made of wool, camel’s hair or goat’s hair in the Middle East, you may make yours of a washable cotton or cotton-polyester blend. The traditional colors are black, white or brown, trimmed with braid. One size fits all. Chalwar are the draped pantaloons worn by men in North Africa and the <?xml:namespace prefix = st1 ns = "urn:schemas-microsoft-com:office:smarttags" />Middle East. The chalwar fit tight around the ankle and the lower part of the leg with a wide, pleated and draped upper portion which gathers around the waist. For dress occasions the chalwar are made in a fine black wool or silk trimmed with black braid over all seams. The chalwar are worn with a white cotton or cream silk kurta (shirt) with the hizaam or kusak (a wide silk sash, many yards long, wrapped around the waist). Separate cutting lines for small, medium and large on same pattern. This richly embroidered bolero-like vest or jacket is worn by men over a white shirt and with a sash. You may choose to trim your cepken with braid, decorative ribbon or fur trim. For dress occasions the cepken is made in a fine black wool with gold braid, embroidery and buttons. Three sleeve variations are shown. Separate cutting lines for small, medium and large are given on the same pattern.